AR6900-D MAX facilitates a cleaner burn, improves combustion quality helping to improve performance whilst reducing fuel consumption, exhaust emissions and deposit build-up in the combustion area, turbo charger, DPF and catalytic converter. For all diesel fuel types including heavy fuel oil and bio-diesel. AR6900-D MAX contains a proven cetane booster (up to 4 points) to improve combustion efficiency and engine performance, whilst reducing engine noise. A combustion catalyst technology then facilitates a cleaner burn, improving combustion quality further thus helping to improve performance whilst reducing fuel consumption, exhaust emissions and deposit build-up in the combustion area, turbo charger, DPF and catalytic converter. Continuous use will reduce combustion, turbo and DPF deposits reducing the need for other dedicated cleaners or DPF regeneration cycling. Dosage pump systems available for main tanks, bunkers and individual engines. AR6900 is suitable for transport by air. Store Archoil AR6900 in dry conditions. 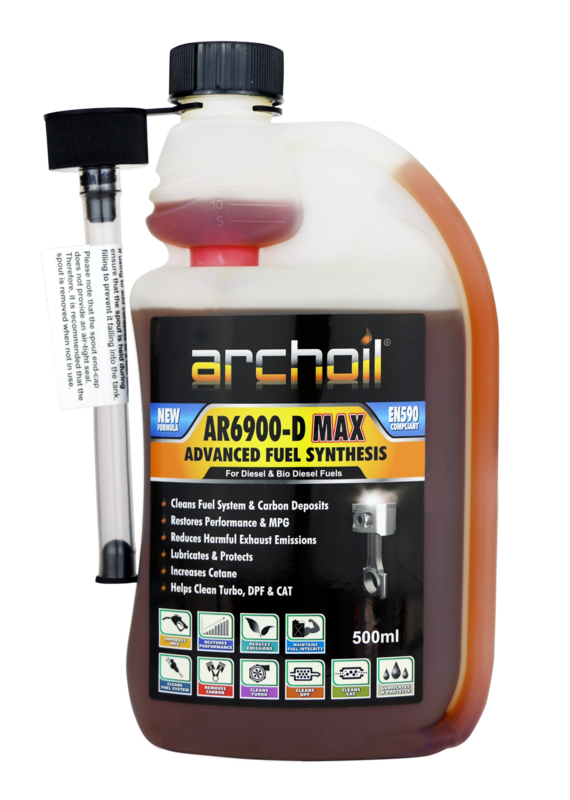 Archoil AR6900 can be stored for 2 years. Keep opened packaging firmly closed. Store Archoil AR6900 at temperatures between 5° C and 30° C.
Archoil AR6900 is available in 0,1L, 0,5L, 5L, 20L, 208L packagings.